General coordinator of the project – Davide Viaggi, University Bologna, Italy. 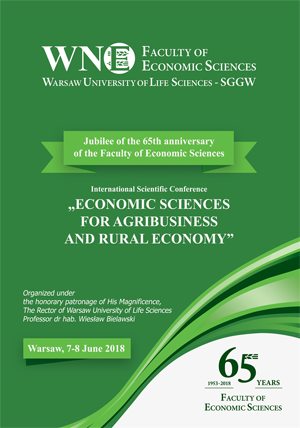 Researches representing WNE SGGW: Edward Majewski, Agata Malak-Rawlikowska, Adam Wąs, Paweł Kobus, Piotr Sulewski, Sylwia Małażewska. Cooperation with Faculty of Horticulture, Biotechnology and Landscape Architecture, SGGW. The main objective of the Project is to provide the knowledge base to support an effective CAP policy design in the direction of improved landscape management, particularly providing insights into the ability of landscape to contribute to the production of added value for society in rural areas. CLAIM gives a deeper insight on the relationship between CAP, landscape and rural economy in order to assess the capacity of landscape in providing socio-economic development and agricultural competitiveness in rural areas, and produce an evidence-based policy support framework on the different and possible contributions of agriculture and the CAP to landscape management. The project improves and extends existing economic models that make use of the FADN informatics environment by developing a unique modelling framework that (1) encompasses all aspects of farmers’ production decisions (2) targets the single farm but also consistently aggregates to regional, national and the EU level (3) takes into consideration the effects of uncertainty and risk on farmers’ behaviour (4) can be employed in different market environments, i.e. throughout the EU-27 and (5) can be amended and/or fine-tuned by EU and national FADN units. The project draws upon two major modelling tools (econometric and mathematical programming), while the validity of the employed theoretical models will be verified by their empirical application in each EU-27 country. The project’s final outcome is the construction of a methodological framework comprised of state-of-the-art economic models custom-built for the FADN database that will provide to policy makers an inclusive impact analysis of the effects of alternative policy and market developments scenarios under a real-life, dynamic context. Given the complexity of this framework, a simplified version of the models will be developed, all consistently and operatively joined into an amendable interface that will be user-friendly and easy to operate and still allow for a concise replication of our policy simulation results, capable to target at the efficiency of CAP measures, i.e. the single farm payment, although the whole framework will be also applicable providing some acquaintance with modelling parameterisation. General coordinator of the project: Harry Blokhuis, Swedish University of Agricultural Sciences, Sweden. 4) analyse the outcomes of EUWelNet and make recommendations on the feasibility and the likely conditions required for an effective European animal welfare network. The project address Council Directives 2008/120/EC and 2007/43 for the protection of pigs and broiler chickens, respectively, and Council Regulation EC1099/2009 on protection at the time of killing. The reasons is that there are clear bottlenecks in their implementation, compliance is likely to improve welfare in a range of species in all Member States, and we believe we can develop good knowledge transfer solutions. EUWelNet is expected to provide a clear model for the future establishment of a coordinated European animal welfare network. Source of financing – Transfer of Innovations, Leonardo da Vinci LLP. Researches representing WNE SGGW: Agata Malak-Rawlikowska, Stefania Czekaj, Monika Gębska. The ISM-project intends to transfer a successful and innovative vocational training tool to help professionals dealing with entrepreneurship and strategic management in agriculture. This applies to agricultural advisory sector, the vocational teaching environment and farmers. SANCO: A preparatory action on control posts. General coordinator of the project – Kees de Roest, CERPA, Italy. The project is a continuation of the abovementioned Project – Preparatory Action on Control Posts from 2012. The main objectives of the project are: 1 – Based on the highest level of specifications recommended by the feasibility study, the project aimed at planning, designing and financing the building or the renovation of high quality control posts in order to set up a reference for the highest standards for such establishments. 2 – Following the outcomes of objective one and other experiences and data the project aimed at validating standards with the view of improving technical and economic viability of a possible certification system. The project identified stakeholders’ possible interest in participating and using an EU certification scheme. The present project has foreseen a significant improvement of the equipment as well as the management of 8 Control Posts (CPs) located at the cross roads of important flows of animals transported over long journeys in the EU. CAP DAIRY: Evaluation of common agricultural policy measures applied to the dairy sector. The objective of this retrospective evaluation was to analyse the economic and structural aspects of the EU dairy sector, and to assess the impacts of the CAP measures applied to this sector since the 2003 CAP reform. Therefore, the first policy changes to be evaluated were those enshrined in decisions legislated in 2003, or decided earlier, but not implemented until after 2003. The evaluation period begins on 1 July 2004, when the first cuts to intervention prices were implemented and the phasing5in of the dairy premium began. However, in order to capture the impacts of implementing the 2003 CAP reform, data from the pre 2004 period are used to establish a reference point or period. Most of the indicators on which the evaluation is based are reported up to 2009 or 2010, depending on data availability. Those based on farm accounting data from the EUFADN data base extend up to 2007. The geographical scope of the study covers the 27 Member States of the present European Union. Project coordinator in Poland: dr Sylwia Żakowska -Biemas, Faculty of Human Nutrition and Consumer Sciences. General coordinator of the project – Ursula Kretzschmar-Rüger, FiBL, Switzerland. The main purpose of this project was to develop the first Organic Sensory Information System (OSIS), a multilingual and centrally based data folder for data deposition along with an interface scheme that serves as a basis for data exchange to the benefit of the organic food market (organic associations, producer, processors, retailer, wholesaler as well as consumers). To this aim, a multidisciplinary and international research approach was necessary which comprised sensory and consumer research linked with standards requirements in different European countries. The extendable data folder contained descriptions of sensory properties of specific products from six product categories as well as information about underlying production methods which explained the sensory differences between organic and conventional as well as consumer and expectations. What are the current welfare initiatives and standards within the EU and in the EU’s most important trading countries? What are the strength and weaknesses of these initiatives and standards to the animal, society and the production chain? What policy instruments can be designed to promote high(er) animal welfare standards as aimed at in the Action Plan on Animal Welfare, and how can progress in the pathway towards these standards be monitored? What are the benefits and costs of upgraded welfare standards and what are the implications for international trading patterns? On the base of these four questions the project addressed recommendations for sound scientific research and policy instruments. General coordinator of the project – Clunie Keenleyside, Institute for the European Environmental Studies, Londyn. The purpose of the study was to gain a better understanding of the nature, diversity, design and operation of the entry-level elements of agri-environment schemes throughout the EU-27. Agri-environment policy is one of the most established policy mechanisms within the Common Agricultural Policy (CAP). Originally targeted mainly at mitigating the environmental impacts of agricultural intensification, it now has a key role in addressing the Community’s environmental priorities across the diversity of environmental situations, agricultural structures and types of farming in the EU27. This study was concerned with the content, structure and design of entry-level agri-environment support, and it did not attempt to measure or evaluate the environmental impact of that support. Project coordinator in Poland: dr Adam Wąs. General coordinator of the project – Frederick Wolff, Stockholm University, Sweden. RECOCA provided scientific outputs that facilitate the implementation of ecosystem-based environmental management of the Baltic Sea, since most management decisions combating eutrophication have to be carried out in the catchment area of the Baltic Sea. To manage remedial actions involving 85 million people in a dozen countries spanning over 105 major watersheds analysis and modelling tools are necessary, which can address the full scope and the various spatiotemporal scales of the problem. The overall aim of the study is (1) to simulate possible future riverine nutrient loads to the Baltic Sea in realistic river basin management scenarios, (2) to estimate cost functions for load reductions and improvements in ecological indicators, and (3) to suggest cost allocation schemes for countries within the Baltic Sea catchment. It applied a nested hierarchical approach to simulate nutrient loads to the Baltic Sea in combination with abatement costs for the various measures ranging from farm scale over regional meso-scale river basin representing EU water districts and characteristic river basin types to entire drainage basins to the Baltic Sea. Project coordinator in Poland: Prof. Edward Majewski. The objective of the CAP-IRE project was to provide an overview of the inter-linkages between the different components of the CAP and the mechanisms through which they have an effect on rural economies. The project’s strategy was to focus on the specific interplay between the CAP, farms and farm-households as the key node through which to understand the connections between policy and the wider rural context. The project was based on a mixed method approach. The main results are based on the outcome of about 2400 interviews of farm households and a wide thematic analysis. Project coordinator in Poland: dr Piotr Sulewski. The study aimed to investigate farmers’ investment behaviour, and evaluate the impact of different CAP scenarios on a selected groups of farming systems, hence contributing to the understanding of the relation between policy objectives and farmers’ behaviour. It largely replicated a similar study carried out in 2006 (Gallerani et al., 2008), and intentionally surveys the same sample of farms and hence providing primary information about changes in investment behaviour between 2006 and 2009 following a panel approach. The impact of alternative scenarios was simulated using farm-household mathematical programming models. General coordinator of the project – Perrine Lavelle, Bio Intelligence Service, Paryż, Francja. The aim of the project was to review the practice of crop rotation in selected EU countries and to analyse the environmental effects of the use of simplified rotations or monocultures. Crop rotation is a farming practice in which different crops are grown in the same field at different times over several years, and which can have positive or negative impacts on the environment and the economy. Crop rotation aims to ensure conditions which are conducive for the development of crops, by promoting soil fertility and minimizing the development of pests and weeds, and also by ensuring better nutrient management. To achieve this, a balance between the combination of crops and the sequence in which they are cultivated is sought. ISAFRUIT is a European Integrated Research Project that focuses on all aspects of fruit from its start as a seed till a consumer bites into a juicy end product. The individual research projects within ISAFRUIT focused on the objective that improving both the quality and availability of fruit and fruit products, together with raising customer awareness, led to an increase in fruit consumption and an improvement in the health and well-being of all Europeans. Project coordinator in Poland: Prof. Mieczysław Adamowicz, Prof. Edward Majewski (mezzo-Leader). The SEAMLESS project developed science and a computerized framework for integrated assessment of agricultural systems and the environment. The integrated project was funded by the EU Framework Programme 6 (Global Change and Ecosystems). The SEAMLESS project aimed at advancing the science for integrated assessment of agricultural systems and translating this into operational re-search tools and models. A key deliverable of the project is an integrated framework (SEAMLESS-IF) that integrates relationships and processes across disciplines and scales and combines quantitative analysis with qualitative knowledge. It builds on the concept of hierarchical systems theory and attempts to enable flexible coupling of models and tools. International Visegrad Fund: European Union Public Administration and Development Policies and Variations in V-4 Countries.